This is not a review of 999: The Novel, which has only just appeared for iOs devices. 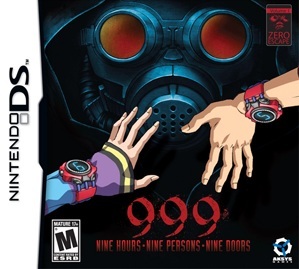 Instead, this is a review of the DS game from 2010 that this ‘interactive novel’ was based on, called 999 – Nine Persons, Nine Hours, Nine Doors. The original version can also be called a novel, belonging to the gaming subgenre dubbed ‘visual novels’. These are story and character-driven games with a strong textual element to them. They tend to be presented with a combination of static and dynamic (manga) visuals. 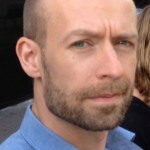 What kind of gameplay is entwined with the story, will differ from one game to the next. 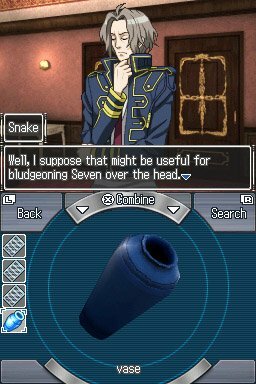 The Ace Attorney series is an example of one particular approach to the genre and it was when I was looking for something similar, that I ended up reading about 999. The main difference between the iOs and the DS version of 999 is that puzzles from the DS version have been excised. The iOs version just keeps the original’s branching paths that lead you to one of six endings, depending on some choices you make. It is basically a choose-your-own adventure comic. The DS version tells the same story, but uses ‘escape the room’ puzzles to involve the player. So what is 999 about? 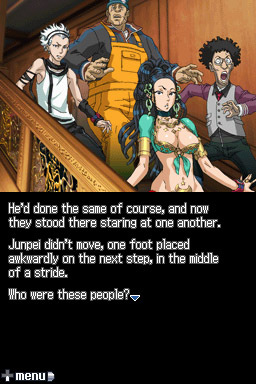 You are Junpei, a student who was drugged and abducted for reasons unknown. You wake up trapped in a room you can only escape by solving a puzzle. It involves you first finding and combining some objects and then doing some calculations. This is the mould for most of the puzzles to follow. You soon run into eight other people who have also been trapped and you find that your captor has an unhealthy obsession with the number 9, with ‘digital roots’ and the hexadecimal system. It is announced that you are all participating in something called ‘the nonary game’. You will have to escape within 9 hours or die by drowning. Is your captor some kind of deranged math professor? Time will tell. As you go, you will learn more about the other participants, piece together why you all have been picked for this game and ultimately figure out what the endgame is. The characters are interesting, if cartoonish, and the descriptive texts are generally okay though sometimes a bit clunky. The mood is not always consistent, awkwardly shifting gears between stressed, fearful and funny. It makes sense that the writers would want to lighten the tone occasionally, but they pick weird moments for the characters to crack wise. For instance, if you are locked into a freezer and are about to freeze to death, this is not the best time for a jokey-joke. The dialogue is also oddly laid-back and extensive, considering that the captives should be rushing to escape their traps. Then again, as a player you don’t need to rush either, as you are not being timed. 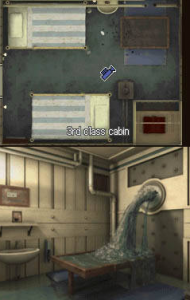 The first room you wake up in, starts to fill with water, but you can browse around the room and figure out your escape at your leisure. The puzzles are a mixed bag. Some of them are fun, though your enjoyment of most of them will hinge on how much you like to play around with numbers. On the one hand, it’s easy to see why they were culled for iOs. I didn’t have the patience for some of them, looking up the solution to just get on with the story. On the other hand, they are so central to that story, that not playing any active part in their solution would hamper your immersion. Trying to escape yourself is more involving than watching someone else escape. The DS puzzle version has a big failing that was rectified for the iOs version. To get the ‘real’ ending, you need to run through the game at least twice, making a very particular series of choices. This makes sense thematically, as it ties into some X-Filesian science that is discussed at length. However, experimenting with your choices in the DS version is a frustrating process, as you can speed forward a bit faster through dialogue you’ve already encountered before, but can’t skip scenes entirely and have to start from the beginning of the tale each time you finish a run. Bizarrely, you will also then have to solve the puzzles you already solved all over again, going through the motions to get them done. In short, it easily leads to a massive waste of time. Not willing to invest that much, I first looked up how to get to the necessary ‘false’ ending and then to the ‘real’ ending. As these two paths don’t have much overlap, playing them remained enjoyable. I can’t really recommend doing it any other way. The iOs version allows you to jump back to where you made significant choices and follow a different branch. This makes experimentation a lot easier and wil allow you see all the variations. However, it comes at the cost of a loss of immersion because the puzzles have been jettisoned. So. There are two imperfect versions of this game, which in either iteration serves as the first chapter in a planned trilogy. 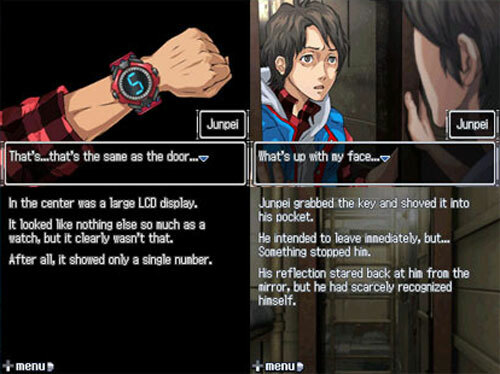 The second part is out for the 3DS already (Virtue’s Last Reward) and places the ‘nonary game’ in the future with a few new twists. This time it is presented by a psychotic-but-cute rabbit A.I. (don’t ask). Some of the cast of 999 returns, meaning there is added value to experiencing that story first. The second chapter features improved graphics, puzzles and the ability to follow different branches with minimum replay. If you just want a primer before getting into the second game, rip through the iOs version of 999. It’s cheap and readily available. If you want to experience 999 ‘properly’, look up the two important story paths and try to score a copy of the DS game, which was never officially released in Europe (but is region-free). Either way, the story of 999 may be imperfectly told, but it remains an intriguing tale and a worthwhile experience.